- Size: 38,000 SF two-story BSL-2 laboratory/administrative building and 1,120 SF one-story entry control point building. - Notable Features: LEED Gold, EPAct compliance; fully integrated BIM in REVIT; SCIF per DCID 6/9 compliance; SIPRNET; DOD ATFP compliance; Intrusion Detection System (IDS); CCTV, Card Access and Employee Tracking; Design-Build project. 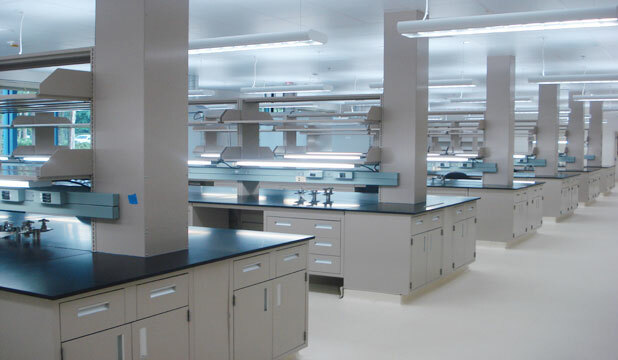 - Project Summary: Alphatec provided total A/E services for the design and new construction for a highly secure NBMRDL including laboratory programming and planning for molecular, immunology, vaccine, genomics, and operations laboratories, as well as select agent preparation and storage rooms. The project was presented to and approved by the Garrison Property Planning Board.